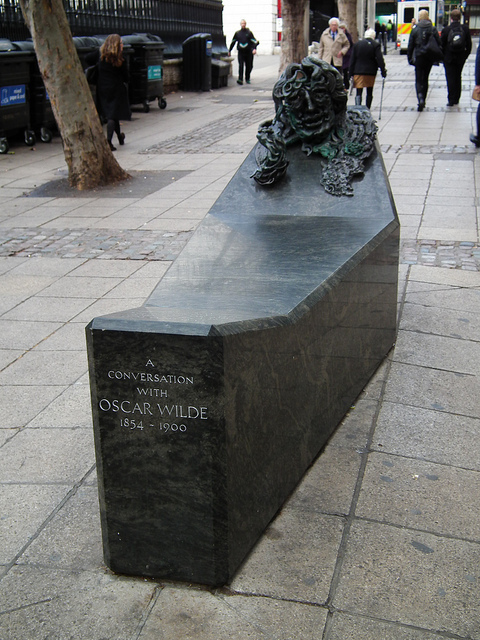 Is The Oscar Wilde Memorial A Bench? Laura Reynolds Is The Oscar Wilde Memorial A Bench? In 2014, David, an American visitor in London, and his wife, asked us whether the Oscar Wilde sculpture, A Conversation With Oscar Wilde, located on Adelaide Street near Charing Cross, is a bench to be sat on, or a sculpture to be admired from a distance. Taking it to be a bench, they sat down "until some random dude started yelling at us. He screamed, 'This is a sculpture to a great man and not a bench! Get the hell off! '", leaving David wondering whether he had made an 'American faux pas'. As David points out, the sculpture in question is the size of a bench, the height of a bench, the style of a bench, and, well, looks like a bench (or a coffin). The very shape of the sculpture, with sloped sides and a flat centre, invites you to sit down. Furthermore, the title of the piece, A Conversation With Oscar Wilde, has been cited by many as further incitement to take a pew and engage in chit chat with the stone head of the deceased playwright. "The idea is that he is rising, talking, laughing, smoking from this sarcophagus and the passerby, should he or she choose to, can sit on the sarcophagus and have a conversation with him." So, to the person who chased David and his wife away; your respect for, and protection of, A Conversation With Oscar Wilde, is admirable. But you're wrong. It's a bench. A Conversation With Oscar Wilde featured in our gallery of London's best literary statues.